If you don't mind paying a bit extra to get the absolute best and highest quality then the Thunderlinx™ USB to Serial adapter is for you. As all other USB serial adapters the Thunderlinx™ adapter converts serial data to USB data and vice versa, so why pay more? Its actually relatively simple: the better design of the internal circuitry and the higher quality of components used the better and more reliable the adapter will be. 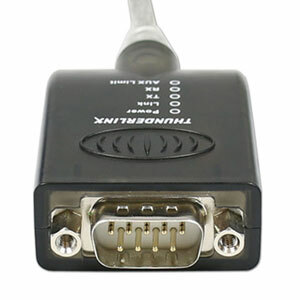 Here are some of the features which makes the Thunderlinx™ USB to serial adapter so special. Many standard USB to serial adapters will work well with simple applications in clean office environments, but often fails if you try to use them with more complex applications, non-standard devices, older operating systems or where electrical noise is present. The Thunderlinx™ adapter puts an end to all these problems as it has been carefully designed to work reliable in as many environments as possible and with as many applications and devices as possible. The Thunderlinx™ USB to serial adapter's circuitry has been developed, improved and tested over several years with thousands of applications. Not only has the design been thoughtfully developed by our engineers it has also actually been tested extensively in the field. There are many USB/Serial processors on the market today, however there are only a few good high quality processors. Most USB to Serial adapters are made with a low-quality processor because it is cheapest, but unfortunately also the worst quality. 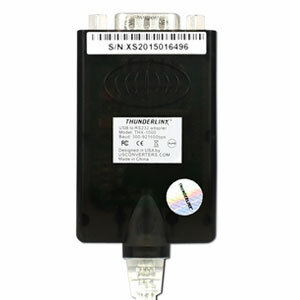 The Thunderlinx™ adapter is designed around the new generation FT231X processor from FTDI Semiconductors which is a newer optimized version of the popular FT232RL processor. The FT231X has several advantages over the older FT232RL processor; besides improved reliability, it uses MTP memory instead of EEPROM memory which makes it possible for the user to easier access the memory functions and change the parameters. Another invaluable feature is that the drivers for the FX231X processor are in as high a quality as the processor itself, which means less problems and higher reliability and compatibility with almost any operating system and device. The most important thing next after a great design, reliable processor and drivers are reliable and high quality supporting components. 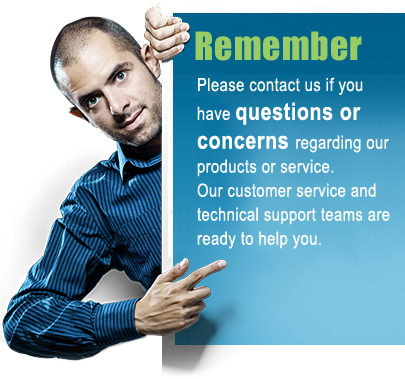 Supporting components are the components such as resistors, capacitors, transistors, serial drivers etc. Together these form the protection, filtering and indication circuitries and also helps with the data conversion. Our engineers has carefully selected each single component the Thunderlinx™ USB to serial adapter is made of so that they are fully compatible with each other and creates the perfect complete circuitry. This means better noise reduction, better electrostatic (ESD) protection and support of true high speed baud rates for up to 921600bps (most other USB serial adapters claim to support high baud rates but fact is that they don't due to a low-cost serial driver). What good is a product if its difficult to use? 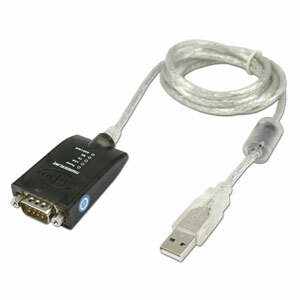 Well that is why we made the Thunderlinx™ USB to serial adapter easy to use. Not only does the drivers automatically download and install as soon as you connect the adapter to your Windows PC's USB port (provided your PC is connected to the Internet), the adapter also has several LED indication lights which shows when the adapter has power, when it is ready to use, when its sending and receiving data and if there is a current limit. The LED lights are a great help when trying to find out what is actually going on with the adapter. 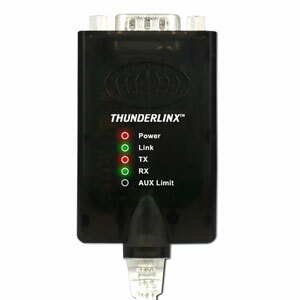 As a special feature, rarely seen in this price range (or in any price range for that matter), the Thunderlinx™ USB to serial adapter provides 5V DC on pin 9 which can be used to power serial devices connected to the adapter. The power is limited to around 450mA so you don't have to worry if it will damage your USB port if your serial device malfunctions and draws more current. Current limit is indicated with a LED light. Pin 9 power is nice to have if you want to power a serial device directly without any external power supply. Programmable processor parameters. Download software and instructions.